Sharon Oliver ‘Brings Consciousness into the Classroom’. These are flexible programmes that can be tailored to fit any situation. Parent Support Groups – offers parents a chance to come together and develop strategies to deal with stress and pressures in home and community. This creates a strong community and home-life which fosters a healthy environment and helps children to come to school prepared for learning. Tools and strategies are provided for parents, and this is a safe/respectful place to join in. I have been bringing parent groups into schools for several years now, and find the same thing each year, and with each group. Parents need a lot of support! When parents feel supported, their children directly benefit. I love to see the tools being passed on to other family members, friends and neighbours. This type of learning has far-reaching impact! Breathing technique workshops – these workshops teach children relaxation and deep breathing techniques. Proper breathing helps children to focus on learning and recall information with more ease. Other benefits include reducing stress, and improved health – all factors leading to better performance in school. The children and/or staff are taught basic and simple techniques to expand their breathing and awareness. The techniques are simple, repeatable, and can be practised to ensure that they become valuable tools which can be applied quickly and easily in many situations. These techniques have a meditative quality, and more and more we are recognizing this to benefit academics and relationship building. From an article in the Globe and Mail, November 10th, 2011. “Relax, kids: Meditation touted as a stress buster for children.” “And more clinical evidence about the efficacy of also targeting parents may be on the way.”, based on a University of Toronto study. This is a flexible programme that may be taught to many different group populations within the school system. Teaching Teachers’ Qigong. 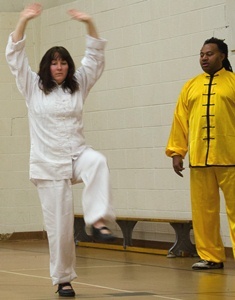 I have been teaching teachers Qigong with my partner Sifu Rupert Harvey. Qigong, chi gong (pronounced “chee-gung”) is a 5000 year old art and is a practice of aligning breath, movement, and awareness. The object is to cause acupuncture meridians to be relaxed which opens and allows for a normal flow of energy through these and connected organs. Qigong is ideal for exercise, healing, and meditation. It is used in Chinese medicine, martial arts, and philosophy, and is traditionally viewed as a practice to cultivate and balance qi (chi) — translated as “intrinsic life energy”. Typically Qigong involves rhythmic breathing coordinated with slow repetition of fluid movement, a mindful state, and visualization. Qigong is now practiced throughout China and worldwide and is considered to be exercise, medicine and meditation. Qigong is believed to help develop human potential, and awaken one’s “true nature”. Our program offers standing and moving Qigong based on the teachings of Yee Ch’uan Tao and Wuji Qigong systems. 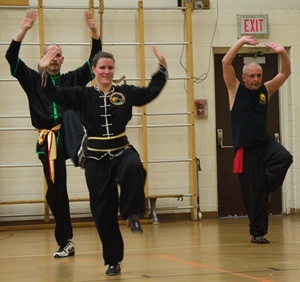 The teachers are taught a set of Qigong movements that they can bring right into the classroom and apply immediately. Qigong also has the benefits of an ‘original braingym’ effect which balances the brain hemispheres for whole brain learning! The Pilot programme we did with Equinox Alternative Holistic School has been extremely successful, and teachers have been able to implement the learnings within the classroom immediately. It is rewarding to see the teachers effectively using the Qigong techniques and the response that it evokes from the children. “I have recently had the privilege to attend a series of Qigong classes for teachers, led by Sifu Rupert Harvey and Sharon Oliver as part of ‘Bringing Consciousness into the Classroom program. I really enjoyed the relaxed, calm and safe space Sharon and Rupert created in each class and soon found that on weeks where I attended a class I felt a calm consistent energy and had more energy and focus in general throughout the week. Having been a classroom teacher for many years in a variety of different settings, I could immediately see the immense value these simple movements could bring to the school setting, for teachers and for children of all ages.